We are surrounded with music. The beating of our hearts, the flowing blood in our veins, our voices, the hushing trees, gushing rivers, cool breeze, blaring horns… they all come together to form a unique sound called music. Like my music teacher used to say, God gave us heartbeats for He wanted us to listen to this music every time as we continued living. But somewhere in between we forget the music of our heartbeats as it drowns amidst the logic of our minds, the hullaballoo of our senses and most importantly the chattering of ‘other noises’ around us. At such times the only thing that brings back music for us is the lovely songs that we keep listening to. We have a huge variety of music available for us – country, hip hop, instrumental, jazz, classical, Sufi, fusion etc but their beauty remains the same. I am die hard music lover and listen to it in various languages for I believe music has the magic which transcends all the language barriers. Needless to say every person is my life is a song for me. The moment I meet someone and interact for a while a song starts playing in my mind. And that defines that person for me permanently. I entered the teens and had my first crush ever- He was “Na woh inkaaar karta hai no who ikraar karta hai…” for me. I went on to fall in love so many times in life, each time a new song depicted that person and it still continues to do that. So I have someone who stands for Agar Tum mil jao, Khuda Jane, Pee Loon, Ishq wala love and recently Yaaram too. 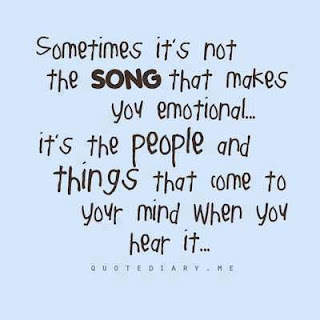 I also have songs for friends, frenemies, family members, loved ones, agony aunts and not to forget people whom I love to hate. Some of them are Jaane kyun, Khud ko kya samajhta hai, taiyab ali pyar ka dushman hai hai… And ofcourse then there are some which I feel define me in the most perfect manner and hence are very close to my heart for obvious reasons. Like Khushi and Filhaal. I have made a huge list of songs which I would want a special someone to sing for me. And all these are neatly scribbled in a beautiful diary. I love writing down songs for some weird reason. I find them to be very poetic and when I re-read the lyrics I somehow find them talking to me, telling me some unheard things. And ofcourse I have also penned down female versions of songs I have loved a lot in male versions myself sheerly for the beauty it had in its verses. 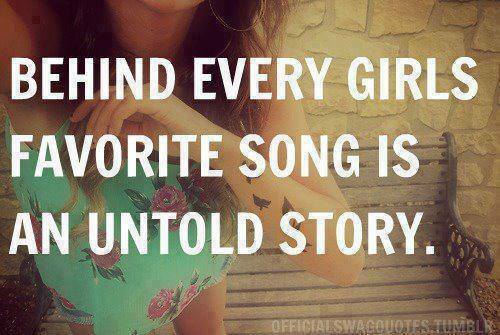 And now if you are wondering which song you are………… then just drop a message and I will let you know that !! It is a new and fascinating thing to know how you associate songs with people. It's a wow thing. Even I was floating in the air with music in my eyes as I wrote this. Its new and fascinating? Aayi Re Aayi Re Khushi Khushi Khushi Khushi)..
Glad you loved it and yes weird is the new "In"
I love music! And the quotation is so true!! Oh yes! I am glad you agree. Suno, kaho. Kaha. Suna Kuch hua kya? Aur mere liye kya hai? A lot of thanks privy ,but i w'd like to edit some line for me . bandhan toote ,tootne na do. koi chhoote ,chootne na do. Zindagi geet aur taal ke mel hein. Yes, me, you are correct.Everything on earth is musical and rhythmical.Music is the magic that charms listeners' mind and changes listeners' mood.Nice.